Click the "Archive Old Data" command on the File menu. If you have many old events, tasks, or notes which you no longer use, archiving your old data can help speed up VueMinder and decrease its memory use. The archived data will be exported to iCalendar (ics) files which can be imported later as needed. 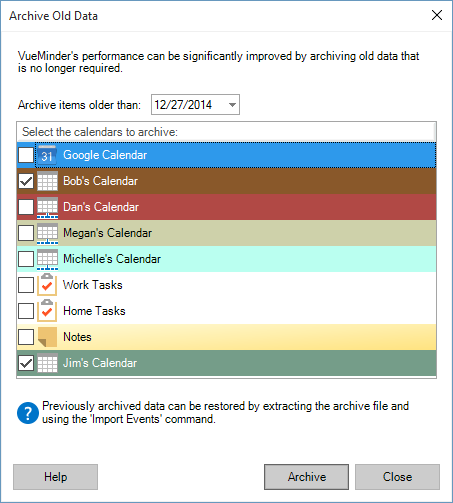 The Archive Old Data window will list all editable calendars. Use the checkboxes to select the calendars to be processed. By default, all editable calendars will be selected. A cutoff date can also be specified. Any events, tasks, or notes that occur before the cutoff date will be archived and removed - with the exception of recurring events that still have occurrences after the cutoff date. The default cutoff date will default to 1 year in the past. After using the checkboxes to select the calendars to be archived, click the Archive button. A window will appear where the file name and location of the archive can be specified. Make a note of where you store the archive file, in case you need it later. After the Save button is clicked, the archive will be generated. Depending on the number of items archived, this might take a few seconds (or more). A message will appear after the archive process has completed, indicating how many items were archived and removed from VueMinder. The archived data will be stored in a compressed file. Each archived calendar will be a separate iCalendar (ics) file within the archive. 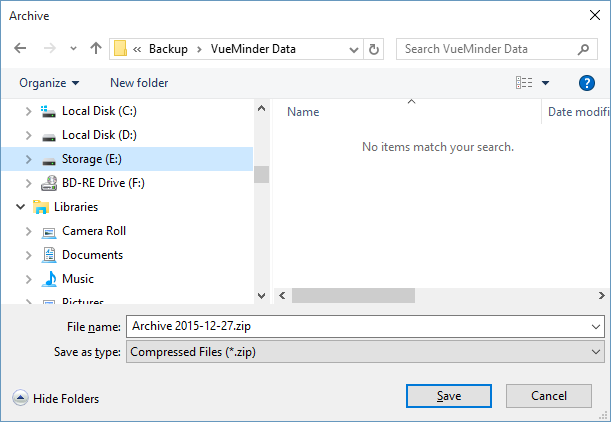 If you ever need to restore data from the archive, you can extract the archive and use the Import command on the File menu in VueMinder to recover your previous data.